LyX is an advanced open source document processor running on many Unix and some non-Unix platforms. It is called a "document processor", because unlike standard word processors, LyX encourages an approach to writing based on the structure of your documents, not their appearance. 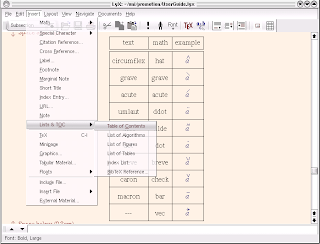 LyX lets you concentrate on writing, leaving details of visual layout to the software. LyX automates formatting according to predefined rule sets, yielding consistency throughout even the most complex documents. LyX produces high quality, professional output -- using LaTeX, an open source, industrial strength typesetting engine, in the background. With LyX, short notes or letters are a snap. LyX really shines, though, when composing complex documents like technical documentation, doctoral theses and conference proceedings. 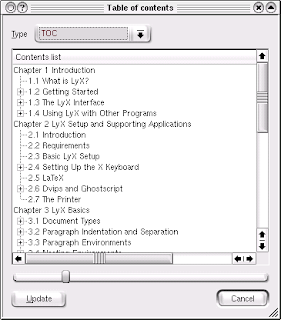 LyX offers extensive control over margins, headers/footers, spacing/indents, justification, bullet types in multilevel lists, a sophisticated table editor, an emacs-style version control interface for collaborative projects, basic change tracking, 'branching' for parallel document versions -- the list goes on and on. The package includes many standard formats and templates -- e.g. for letters, articles, books, overheads, even Hollywood scripts. Work continues on a growing library of "plug-in" formats and templates, in the best open-source tradition. 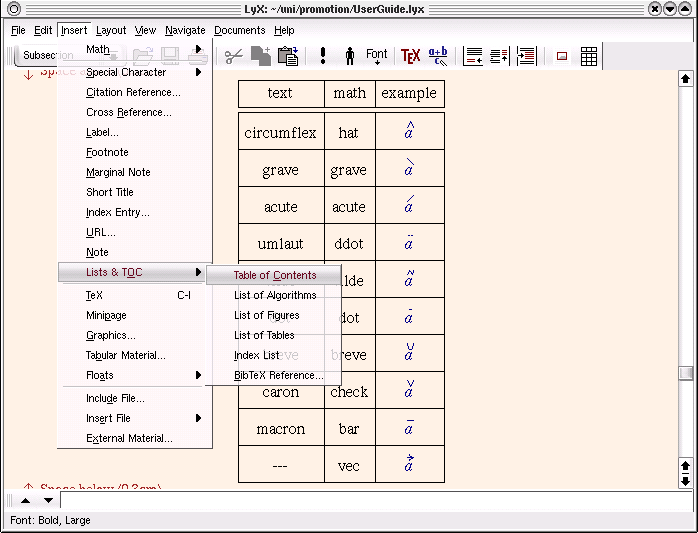 LyX presents the user with the familiar face of a WYSIWYG word processor. However, users familiar with Microsoft Word or WordPerfect may be perplexed by certain basic LyX behaviour. For example, repeatedly hitting the space bar has no effect! This is by design: LyX puts in the proper spacing for you, intelligently. Welcome to the LyX paradigm! Compared to a word processor, LyX offers simpler and more abstracted ways of managing fonts. This is by design too: 'finger painting' is frowned upon, use of 'character styles' encouraged. You set the "ground rules" and place the elements of your document into proper categories. Let's say, you tell LyX that a certain line is a Section title. LaTeX adds the Section to your table of contents, places the Section name into your page header, gives it a special "bold" appearance on the page, assigns it a number or label, and tells other parts of your document what page it's on, for references and citations. Many of the headaches of traditional word processing just vanish. LaTeX easily processes hundreds of chapter and section labels, thousands of footnotes and inserted graphics, intricate cross-references, complex multi-level outlines, formatted tables of contents and lists of illustrations, and exhaustive indices or bibliographies, and is rightly famous for the superb quality of its output. Users already acquainted with "raw" LaTeX will find that LyX offers full LaTeX transparency and export of LaTeX documents. Import of LaTeX is trickier, but works well for non-weird documents. 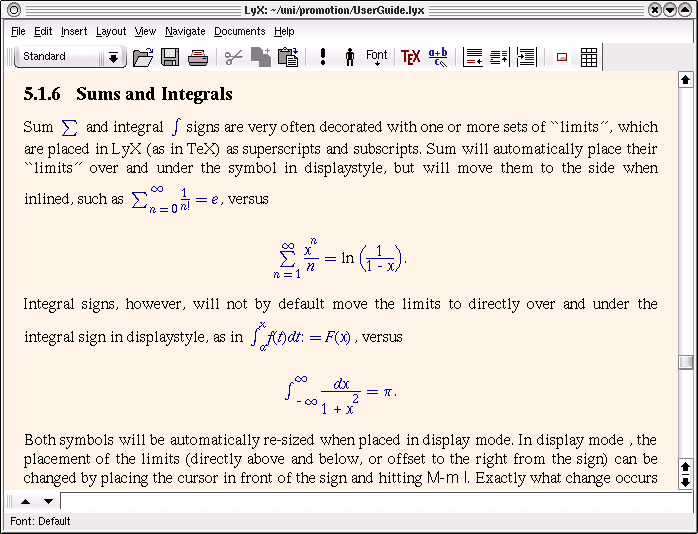 LyX contains a fully integrated formula editor which is easily best-of-breed, adding WYSIWYG point-and-click convenience to LaTeX's legendary math typesetting capabilities. If you're into scientific authoring, this is the jewel in the crown. Try it! 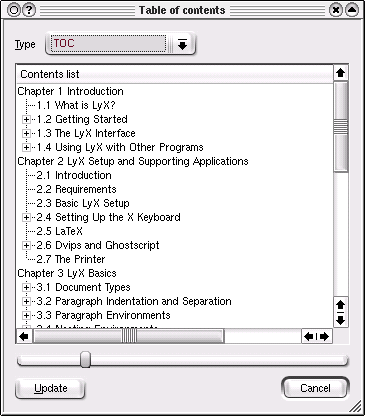 Think of LyX as the first WYSIWYM word processor: What You See Is What You Mean. 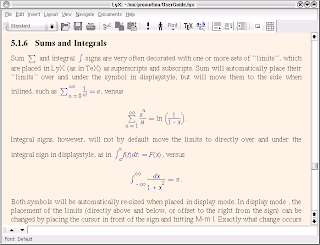 All the common formatting intelligence of LaTeX is presented to the user through visual controls, like a table-of-contents window acting as an outline browser, "live" reference links (to figure and table captions, sections, pages and literature citations), automatic multilevel section and list numbering, and more. You tell LyX how to treat particular words and lines in your document: e.g., this is standard text, this is a Section title, this is a footnote, this is a caption beneath an inserted graphic. As you click your selections, the WYSIWYM interface gives you clean, straightforward "visual cues" (actually, very WYSIWYG-like).